ABOVE: A Leonardo Express train leaves Termini Station for Leonardo da Vinci International Airport in Fiumicino, a suburb of Rome. 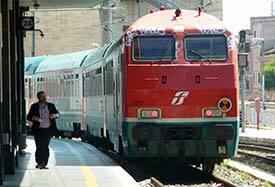 The Leonardo Express is the quickest way to get from Fiumicino Airport (a.k.a. Leonardo da Vinci International Airport) to central Rome. Trains run at 15- to 30-minute intervals from early morning until late at night, taking just 32 minutes to cover the 30 km or 20 miles between the airport and Rome's Termini Station. The Leonardo Express first-class fare of €14 is about 50 percent higher than what you'd pay for a second-class ticket on a normal commuter train between Fiumicino and Termini, but there are no intermediate stops, and you won't have to worry about jockeying for a seat during rush hour. Other trains that are worth considering if you're short on cash or are traveling to the historic center, Trastevere, the cruise port at Civitavecchia, or other areas that are easier to reach by commuter rail. For more information about Leonardo da Vinci Airport (including other forms of ground transportation such as taxis, buses, and shuttles), see our Fiumicino Airport article. Note: Departing passengers who use the Leonardo Express to reach FCO get a discount on the optional "Fast Track" security line in Terminal 3 and cheaper access to VIP lounges.